Larry and his sidekick Stephen Moore are now on a journey to cajole the Fed into doing everything Larry has ever said the Fed should not do — dethrone King Dollar. Laffable Larry’s change of heart has come about because it is now unavoidable fact that the tax plan he concocted with Stephen Moore, based on Larry’s beliefs about the Laffer Curve, is not only failing to pay for its own tax breaks as Larry & Moore assured the world it would, but also not doing a whole heck of a lot to stimulate the economy any more. Larry & Mo’s tax plan boosted the stock market … for awhile … but GDP got only one boost in the second quarter of last year and has been falling ever since. This quarter, GDP growth is expected to come in well below where it was when Larry & Mo’s plan became law (diving to somewhere around 1%). And that is why Team Trump — the Trickle-down Trio of Larry, Mo, and Surly (the orange one) — is working the Fed to get some monetary salvation for their damned tax plan. The White House pressure on the Federal Reserve heated up again on Friday after President Trump’s adviser Larry Kudlow said he wanted the U.S. central bank to “immediately” cut its benchmark interest rate by 50 basis points. “Immediately” doesn’t sound like there is any great need, and Kudlow has often assured us the economy is going to come in like gangbusters. The Fed, on the other hand, is only interested in holding interest rates right where they are now for the indefinite future, though numerous prognosticators, including those far more bullish than myself, are betting the Fed cannot. All the while, Chairman Powell insists he is paying no attention to the White House. King Dollar is the divine ruler in whom Larry Trusts. That is why the dollar has “In God We Trust” inscribed upon it. It is Larry’s god. 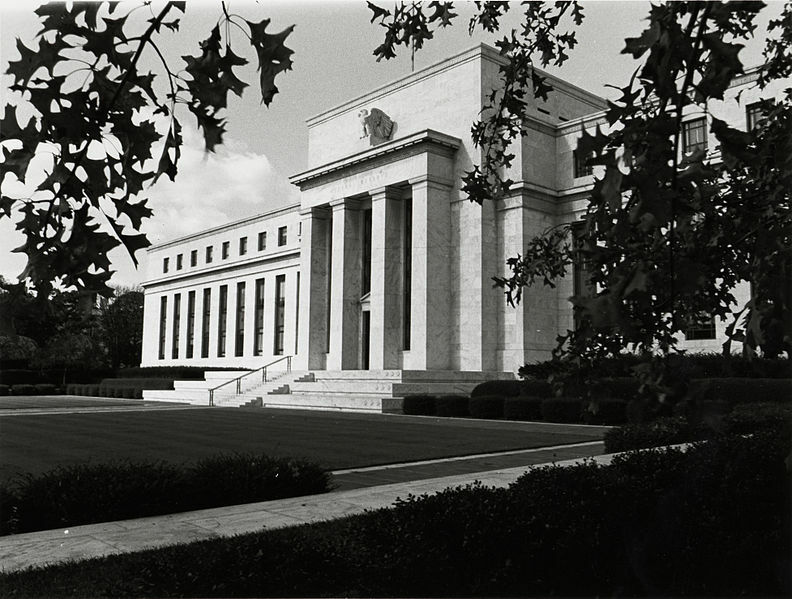 It is many people’s god, but Larry is now beseeching the Temple of the Dollar, otherwise known as the Eccles Building (or the Fed’s HQ), to diminish the value of his god by dropping interest rates by the largest change in one drop the Fed has made in a long, long time. Larry is begging. Never mind that only a few months ago Larry was pontificating about the superior health of the American economy. If you believed him then (in November) and now (when he blames economic decline on the Fed going to far with interest increases), then you are forced to believe a mere quarter-percent raise in the Fed’s target rate (in December) snuffed out a vibrant and potent economic expansion! 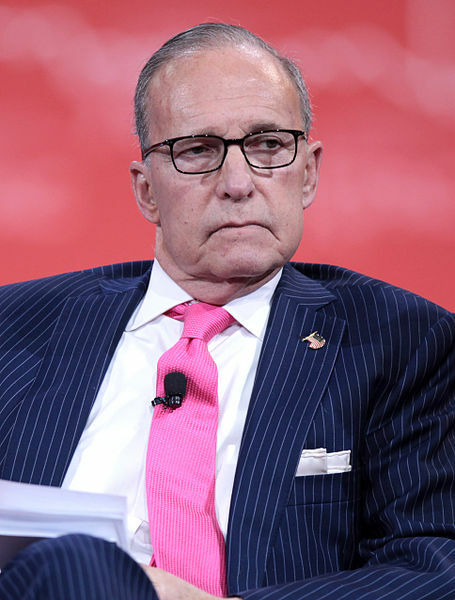 Axios reports that Kudlow “would love to see” such a downward move, adding that the central bank shouldn’t have ever set overnight interest rates past 2%…. The problem for Kudlow in calling for this immediate rate-cut is this – the last three recessions all saw a Fed rate-cut three months before they started. So, the economy that Larry has repeatedly said is doing admirably well under his plan cannot survive a Fed benchmark interest rate above a “highly accommodative” (as the Fed likes to call its relaxed monetary policy) 2%. What is Larry so worried about? Normally, the Fed has never dropped its prime lending rate down to 2% unless the nation is already deep in a recession. Larry is imploring the Fed to do something it has never done before! How desperate is that? As Sven goes on to argue, you have to be really “worried about a lot of things” in order to utter such a request out of one side of your mouth while you are praising the strength of the economy under your tax cuts out of the other side. You have to know that is going to look stupid and irreconcilable, so you have to be desperate to hope that somehow you can pull it off. The Fed already acquiesced to President Donald Trump’s efforts to humiliate Powell into stopping the Fed’s plan of raising interest rates and downsizing its balance sheet (methods of tightening the monetary system). The Fed learned a harsh lesson that the economy (fake as the recovery has been) cannot survive any more tightening so it abruptly curtailed its plans to continue down that path just as The Donald required. Desisting from damaging the effete economy, however, was not enough capitulation to the president’s requests. So, now the president is appointing a henchman to infiltrate the Fed and cajole it internally into re-relaxing monetary policy. One might well say that, according to Larry, the nearly flatlining economy already needs a major shot of adrenaline to lift it back into the land of the living. Hah! The federal government is now running at almost that deficit level every year now just to maintain normal annual operations. Its budget is a sea of red ink as far as the eye can see. Yet, the Trump government believes it needs to maintain that spending in order to get re-elected because … well, imagine how much worse the economy would be doing if all that fiscal stimulus ground to halt, stalling the great military-industrial complex and all the jobs created by creating all those weapons of mass uncreation. “Our chairman?” As if he’s wholly owned by the White House? “Not going to displace him?” As if they believe they even can? Moore has assured us all that his monetary policy is a perfect match to President Trump’s monetary policy. That assurance should not leave us thinking that Trump is trying to implement his own monetary policy for his own political reasons via an inside operator. To assuage our concerns, “Growth Hawk” Moore, as he calls himself, says repeatedly in the embedded video below that he believes in his own independence (though he says nothing about Fed independence, which must, therefore, be less important). Federal Reserve nominee Stephen Moore called the Fed’s December interest-rate hike “a very substantial mistake” while adding that he looks forward to working with Chairman Jerome Powell to help ensure the U.S. economy continues to expand. Sure he does because the plan he and Larry concocted certainly isn’t doing the trick! So, they need to get into the Fed to “help” make it happen there. That’s what he said last time, and the Fed’s plans to keep raising rates and to start reducing its balance sheet were already widely known. With the president scurrying to insert his own tax planner into the Fed and Larry crying in public for the Fed to cut its interest rate target half a percentage point (a 20% reduction of the 2.5% rate), I’d say it sounds like they all believe the Fed learned too late and went too far. Moore said that Powell and others members of the Fed board “should be thrown out for economic malpractice’’ after raising rates…. The Fed’s attempt to return to normal, not only killed its recovery (which was totally predictable) and cropped the stock market by 20% last fall, but it zapped all of the mojo out of the great Trump Tax Cuts. So, this is damage control by Team Trump — “substantial mistake” recovery time. But, hold it, deflation increases the value of King Dollar, and Larry has always said he loves a strong dollar. So, why are they trying to create inflation with interest-rate reductions when that reduces the value of King Dollar? These luminaries of irreconcilable interests and beliefs are our brilliant planners!